Leaf spot is one of the most widespread fungus in coolseason turfgrass in our area. It begins as little brown spots on the sheaths, leaves and stalks. As it begins to grow the dark brown spots grow in size and the center turns a lighter brown thus indicating the tissue in that area is now dead. Excess thatch, heavy nitrogen fertilization, excess shade, mowing too close, and broadleaf herbicides promote these diseases. The spots may extend the width of the leaf and are somewhat longer than wide. Leaf spots may cause the death of leaf tips. 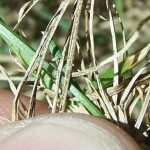 Leaf sheaths are also infected, and may die, resulting in thin stands of grass. Melting out begins as spots on the leaf blades and rapidly moves down the leaf sheath and into crowns and roots. In advanced stages, when many plants die in a large irregular patch, it is known as “melting out”. These patches may range in size from several inches up to many feet and may produce an irregular patchwork across an entire lawn. Once “Melting Out” has begun it is difficult to control Proper watering and mowing techniques are important in warding it off and preventing it inthe first place. If it has taken hold an areas of the lawn have undergon the “Melting Out” process then reseeding is necessary. Reseeding with resistant varieties is recommended as older varietes of bluegrass and other cool season grasses are more suceseptable to disease. It is particularly important to not use excess nitrogen fertilizer and DO NOT water in the evening. Evening watering is never recomended as this only promotes more disease. Morning watering is the only time you should water your turfgrass. Fungicides can be used to stop leafspot but are usually not warranted. Most residential turfgrass will not be adversly affected by leafspot. Only under extreme conditions will this fungus bloom and cause the melting out. Watering and mowing are the most important things you can do to keep this from hapening to your lawn. Over 70% of lawns we look at on a day to day basis are mowed improperly. Dull mower blades, mowing too short, removing too much of the leaf blade, not enough water and many more issues. Please read the following articles to ENSURE at least your mowing habbits are in check. We understand that most folks just can’t water their lawn. Thats ok….At least you can do your lawn the favor of mowing properly. Core Aeration – Improves air circulation and better root growth. Magic Carpet Program – Provides essential nutrients with out the excess nitrogen that causes grassplants to be overly supple and suceptable to disease. Slice Seeding – If your turfgrass has been damaged by a fungus due to extreme weather conditions, this service will sew in more resistant varieties of turfgrass that will be better suited. A few of these blades have leaf spot just starting on them and the other ones are dead from melting out.This is a wide shot of a lawn that has melted out on one section. This is a wide shot of a lawn that has melted out on one section.